Born in 1982, South Korea. Studied Psychology and Electronics in college and received MFA in Film from the Graduate School of Communication and Arts at Yonsei University. Jongkwan continues to produce experimental films based on research with in-depth study of images. Located at the subduction zone where the Eurasian Plate converges with the Philippine Sea Plate, the island of Taiwan has developed a unique topography as a result of the downwelling tectonic activity. Similarly, Taiwan’s position at the boundaries of different political forces within the global geography, and the hidden forces exerted by political, economic, cultural, and ideological plates, have shaped its national identity. Taiwan’s unique landscape and geopolitical history serves as a theme for The Subduction Zone by Shake. Comprised of three short films entitled Our Status Quo, Our Story and Our Suite de Danses, the work traces the intersection of the tectonic plates and travel to Taipei’s Tatun Volcanoes; the Yuli to Antun section of the old railway line in Hualian that traverses the Eurasian Plate and Philippine Sea Plate; and to the Jili Badlands in Taitung. In the eyes of a geologist, these locations are ideal textbook examples of plate tectonics; but what Shake contemplates is whether these landscapes enable an imagining of the political struggles that have taken place on this island. How does an individual find a resting place within the conflicts of divergent social structures, political systems, and ideological modes? How can the status of the self be reimagined and the story of the self be told? In addition to landscapes, Shake also includes constructions of narrative elements in the film, such as archived historical documents, personal memoire, school activities, and cultural rituals, in the artistic practice of cinematic writing. Cinematic writing (écriture cinématographique), is the initial creative approach that inspired Shake’s work. In order to experiment the possibility of narrative form, she plays with the plasticity of moving image to liberate the sense of sound and image, and then make them derived. Meanwhile, so as to resist the film’s rigid institutional mode of representation, in addition to the filming as the only manner, she also tries to work with other different medium and expression form to experiment. Recently, she tries to study Asian geopolitical history in her works. She has participated many international artist residency program, and presented her works in different countries. A group of teenagers conducts a cremation ceremony for a man who is entering the afterlife while still being sought by the military for deserting. Shot on expired black-and-white film stock, the deteriorating image surface echoes life fading away in this tribute to the director`s friend. MONT TESPRATEEP was born in Bangkok but raised in Isan (the northeastern region of Thailand). He graduated with a Master degree in Fine Art from Chelsea College of Arts in London. Since 2014, he has been working on a series of hand-processed 16mm and S-8 short films: Endless, Nameless (2014) and Song X (2017). His films has been shown at film festivals, including Locarno Festival, International Film Festival Rotterdam, BFI London Film Festival, Les Rencontres Internationales and etc. Mont received a completion grant from the programme `Frameworks`, International Film Festival Rotterdam to complete a new work `Confusion Is Next`, premiered at the festival in 2018. He is currently developing his first feature film project. Niyaz Saghari is an Iranian born,UK based documentary maker. Her work is focused on the urban life in her home town of Tehran and Bristol where is based . There are worlds out there they never told you about, 2017 is a video that is part of a larger body of work under the same title. 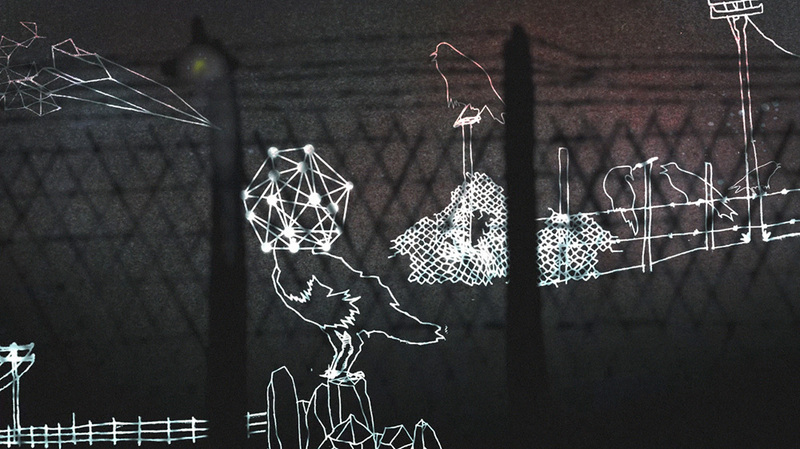 While rightfully addressing tragic stories of migration through water, the work viewed collectively through drawings and new media is also about reimagining freedom through the imagination and creation of fantastic worlds. Worlds that are less about occupying physical space but more about cultivating ways that one can be free in a place where home and freedom remain elusive. Jackie Karuti is an artist based in Nairobi. Her practice is largely experimental and employs the use of new media through drawings, video, installations and performance art. Her work is founded on ideas around knowledge production & accessibility as well as the depths of possibility enabled by radical imagination. Karuti is the 2017 recipient of the Young Artist Award at the Cape Town Art Fair, an alumna of the Gasworks residency program in London as well as Asìko, a roaming Pan African art school designed to redress the frequently outdated or non-existent artistic and curatorial curricula at tertiary institutions across Africa. In 2017 she was shortlisted for the residency program at The Rijksakademie. Karuti has participated in several exhibitions & residencies, both locally & abroad as well as multidisciplinary projects such as curating the Out Film Festival-Nairobi (2016-2018). In 2017 she established the online platform, I’ve Been Working on Some MAGIC which seeks to engage Nairobi based visual artists in critical writing, collective curatorial projects as well as sharing audiovisual material. In 2018 Karuti’s work will debut at the 13th edition of the Dak’Art Biennial in Dakar, Senegal. Mike Hoolboom is a Canadian artist working in film and video. He has made over eighty films and videos, though most have been withdrawn from circulation, approximately a dozen remain on view. His work has appeared in over four hundred festivals, garnering thirty awards. He has been granted the Tom Berner Award for community service and two lifetime achievement awards, the first from the city of Toronto, and the second from the Mediawave Festival in Hungary. He has enjoyed retrospectives of his work at the Images Festival (Toronto), Visions du Reel (Switzerland), Xenix (Switzerland), Cork International Festival (Ireland), Cinema de Balie (Amsterdam), Mediawave Festival (Hungary), Impakt Festival (Holland), Vila do Conde Festival (Portugal), Jihlava Documentary Festival (Czech Republic), Stuttgarter Filmwinter (Germany), Musée des Beaux-Arts de Caen (France), Sixpack Film (Vienna), the Buenos Aires International Festival (Argentina), Pacific Cinematheque (Canada) and A Million Different Loves Festival in Poland. Jongkwan Paik scrute des images de manifestations, essayant d’en déplier les présences individuelles. Shake met en parallèle des phénomènes géologiques, résultant de l’activité tectonique, avec la situation de Taïwan, aux frontières de forces politiques divergentes, et mues par des forces cachées, ayant déterminé son identité. Mont Tesprateep rend hommage à un ami disparu, alors que les militaires sont toujours à sa recherche, pour désertion. Niyaz Saghari réalise une expérimentation visuelle, la poésie dadaïste d’Ali Sarandibi se juxtapose à des danses de femmes iraniennes. Jackie Karuti propose les possibilités de liberté, alors toute idée de foyer semble hors de portée. Mike Hoolboom retravaille l’extrait d’un film trouvé dans les archives de la Croix Rouge à Genève où une infirmière au Vietnam soigne un blessé. Frédéric Nauczyciel propose une étude de corps, de tatouages et de scarifications, qui écrivent et documentent ce que les voix ne disent pas. La peau devient surface de récits, support d’inventions d’identité, d’appartenances revendiquées aux marges, réelles et symboliques. The film uses the methods of presentation as a path to the company of other living beings. It expands upon the issues of ecological moving image narrative, the focus being on presentation, imaging and imagination in the context of the moving image. Née en Finlande en 1959, Eija-Liisa Ahtila vit et travaille à Helsinki. Elle a étudié à l’Université de Californie à Los Angeles, au London College of Priting et à l’Université d’Helsinki. Le travail d’Eija-Liisa Ahtila, installation et film, s’organise conceptuellement autour de la manière dont se construisent images, langages, fils narratifs et espaces. Après avoir examiné les aspects existentiels de l’adolescence et de la découverte de la sexualité, les difficultés des relations familiales, la désintégration mentale et la mort, dans travaux les plus récents, l’artiste questionne les procédés de perception et d’attribution de sens, entre autres à travers des thématiques liant réflexions sur la culture et aspects et existentiels, telles que le colonialisme, la foi et le post-humanisme. Elle a obtenu le prix ARTE Award pour le meilleur film européen au Festival International du Court Métrage d’Oberhausen (2012), le Grand prix du Festival Curtas Vila do Conde (2002), le Prix du meilleur court métrage nordique au Nordisk Panorama (2000). En 2011, elle a été membre du jury du Festival du film de Venise. En 2013, elle a été présidente du jury au FID Marseille. Son travail a été montré dans des musées et festivals, notamment au Musée Guggenheim de Bilbao, au Monderna Museet (Stokholm), à la DHC/Art Foundation for Contemporary Art (Montréal), au Jeu de Paume (Paris), au Museum of Modern Art (New York), au Museo d’Arte Moderna e Contemporanea (Bolzano, Italie), et à la Tate Modern (Londres). Ses films ont été projetés notamment au Festival international du film de Berlin, au Festival du film de Sundance, au Festival international du film de Venise. Eija-Liisa Ahtila réalise une étude sur la narration, utilisant les méthodes de représentation comme un chemin vers d’autres êtres vivants. Une actrice se promène dans la nature, où elle nous introduits à une réflexion sur l’image et la narration. D’autres organismes participent à cette réflexion performative : un oiseau, un cheval, une plante, un papillon. En présence de Katie Davies, Fabian Altenried et Tommaso Donati. At the end of 2014 the Ministry of Justice released an announcement stating that from January 2015, “ every prisoner coming into custody will be asked if they have been a member of the armed forces ” and that “ prisons will be given new guidance about helping them during their sentence”. The announcement followed wide debate over the percentage of veterans in prison. Behind these policy contexts there also sits a wider public perception of the identity of the “ veteran ” which exists in tension with the notion of the “ offender ”. The Separate System was collaboratively produced by veterans through workshops at two local prisons with artist Katie Davies. The piece investigates the spaces of the military, custody and “ civilian ” life through the notion of work, an everyday activity that unites these worlds and is familiar to us all. The film communicates what we, as a civilian audience, perhaps do not understand about the unique set of relations, actions and responsibilities held by the people within these spaces. Created through FACT`s Adults Learning Programme, our work within the criminal justice system aims to approach the context of the prison system from a critically engaged position. Katie Davies is a video artist exploring the construction of identities, their reflections and manipulations. Nationalism, violence and democracy form a central critique for her videos and installations, often focusing upon individuals and communities whose identities are dictated by the state; their agency to self-identify snared between political agendas and Sovereign violence. Katie is a Royal West of England Academician and was nominated for the 2016 Paul Hamlyn Award. She is a Jury member for the International competition, Short Film Festival Oberhausen, 2018 and has exhibited nationally and internationally including FACT Liverpool 2018, Kassel Dokfest, Bratislava International Film Festival and Oberhausen International Film Festival 2017 & 2015, Sarajevo Film Festival 2015, Border Visions, Connecticut, USA 2012 and The Istanbul Biennial 2009. She has contributed to several publications and her writing on practice-led research has been included in US and British publications. Katie is Senior Lecturer in Media & Cultural Production at The University of The West of England. The story of a man who came to Germany 17 years ago. It’s the 31.12.2017, a day in the life of Niaz Ahmadzai from Afghanistan. A never ending story of work, existence, love, familiy and an unfulfilled personality. The perfect integration of a fully functioning machine. Denis Pavlovic, born in 1987 in Stuttgart, presented his first film "Smoother in 350ml" at the No Budget Festival in Tubingen in 2008. Thereupon he studied 3 years Film & Video at the Merz Akademie in Stuttgart. After his graduation he worked as an interne at the Documentary Production Company "Kloos und Co. Medien" in Berlin. In 2011 Denis accomplished his first long movie called "Paranoid Places" and in 2013 his second full-length documentary „Wo tanzen wir morgen" which celebrated its Premiere at the 19th Filmschau Baden-Wurttember Festival. In order to its success it was distributed via Teamwerk Stuttgart. Today Denis is studying documentary direction at the Filmakademie Baden- Wurttemberg and works as a freelancer filmmaker and artist. The main themes his films are about modern society in the midst of globalism and industrialism. Un migrant somalien cherche abri dans les souterrains d`un immeuble prÃ¨s de la douane Suisse italien. Une chanson populaire de son pays rÃ©veille en lui l`envie de partir. Né en 1988, Tommaso Donati est diplômé de l’école internationale de création audiovisuelle et de réalisation (EICAR) à Paris. Son travail se partage entre le documentaire, le cinéma expérimental et la photographie où il explore les relations entre l’homme, l’animal et le milieu naturel dans lequel ils vivent. Katie Davies documente la parole de détenus, anciens membres des forces armées, et appréhende l’articulation entre ordre, détention, délinquance et retour à la vie civile. Denis Pavlovic filme le présent et les aspirations de Niaz Ahmadzai, un jeune Afghan réfugié en Allemagne. Avec Fabian Altenried, nous suivons un saltimbanque androgyne, pendant un jour et une nuit, dans une ville côtière déserte. Au crépuscule, une rencontre lui apporte un moment de connexion. Tommaso Donati filme une insondable nostalgie. Un migrant somalien cherche abri dans les souterrains d’un immeuble près d’un poste de douane. Une chanson populaire de son pays éveille en lui l’envie de partir. En présence de George Drivas et Carlos Aires. The video shows two policemen wearing Spanish anti-riot uniforms, dancing a tango version of the famous Eurhythmics 80´s song in the luxurious and extremely decorated ballroom space of the XIX century palace Museum Cerralbo in Madrid. The fantastic lyric of the song “ Sweet dreams are made of this ” is the central motor of the piece. The tango version cove song has been arranged by the bandoneon player Fernando Girdini and recorded exclusively for the video. In its origins, tango was mainly a dance between two men. Tango was the result of the cultural mix of locals with African, Italian and Hispanic immigrants. It was originally forbidden by the church and rejected by high society, which resulted in its development in poor suburbs and working-class slums. The video reflects about the last years crisis, 15M movement, the violent riots, Cataluña independency, brutality of Spanish police and military forces and the recent antidemocratic Spanish law ” Ley Mordaza ” (the Gag Rule), becoming illegal and punished to take photos or videos of police forces or use of the police uniforms without the Government’s permission. Desire, power, decadence and frustration: they shoot horses, don´t they? Carlos Aires was born in Ronda, Spain in 1974. He obtained a bachelor in Fine Arts at the University of Granada in Spain. Upon graduating in 1997, he moved to the Netherlands and completed his postgraduate studies at Fontys Academy (Tilburg, Netherlands), HISK (Antwerp, Belgium) and Ohio State University (Ohio, USA). He was honored with prestigious grants and awards, including: OMI Residency (USA), Edith Fergus Gilmore Award (USA), Generation2008 Caja Madrid (Spain), Young Belgian Art Prize (Belgium), 1st Award Young Andalusian Artists (Spain), Fulbright (USA) and De Pont Atelier (the Netherlands). He has participated in numerous exhibitions in national and international institutions, such as: CAC (Malaga, Spain), MACBA (Barcelona, Spain), Boulder Museum of Contemporary Art (USA), Imperial Belvedere Palace (Vienna, Austria), MUSAC (Leon, Spain), BB6 Bucharest International Biennale (Bucharest, Romania), B.P.S. 22 (Charleroi, Belgium), 5th Thessaloniki Biennale (Thessaloniki , Greece), Museo de Arte Carrillo Gil (Mexico City, Mexico), Canada Contemporary Art Museum (Montreal, Canada). His work can be found within significant public collections: ARTIUM (Spain), MACBA (Spain), Fondation FrancÃ¨s (France), ARTER (Turkey), CAC (Spain), Maison ParticuliÃ¨re (Belgium), Ministry of Culture of Spain, Progress Art (Saudi Arabia), National Belgium Bank (Belgium), 21c Museum (USA), MAK (Austria) among others. Ivar Vermaë retrace l’histoire de l’ancien bâtiment du Baltic Exchange, bourse du fret maritime mondial, construit en 1903 dans le centre de Londres, et détruit en 1992 dans le plus grand attentat à la voiture piégée de l’IRA. Søren Thilo Funder entreprend la reconstruction d’un moment perdu de narration entre deux fictions hollywoodiennes, « L’exorciste » et « La neuvième configuration », entre illusion et histoire du cinéma. Edward Akrout et Jakob Boeskov combinent pseudoscience et répétition, pour effectuer une expérimentation sur la connexion qu’entretiennent la technologie et la vérité. Soumis à un détecteur de mensonge, les participants à l’expérience répètent des phrases. L’affirmation politique se transforme en croyance. George Drivas s’inspire de la tragédie d’Eschyle, « Les Suppliantes », qui présente le dilemme suivant : faut-il sauver l’étranger ou maintenir la sécurité des citoyens natifs ? Il montre l’angoisse des individus et des groupes sociaux face à une telle question. Robert Todd filme les variations du vent et la permanence de différentes structures, le contraste entre fixité et mouvement. Carlos Aires filme deux hommes. Revêtus de l’uniforme anti-émeute, ils dansent le tango dans un palais madrilène du 19ème siècle. En présence de Carsten Aschmann et Maya Schweizer. CinÃ©aste nÃ©e Ã New York en 1945, Vivian Ostrovsky passe son enfance Ã Rio de Janeiro puis poursuit des Ã©tudes supÃ©rieures Ã Paris en psychologie ainsi qu`en cinÃ©ma. Elle co-fonde dans les annÃ©es 1970 CinÃ©-Femmes, organisme dÃ©diÃ© Ã la diffusion de films de femmes. Depuis 1980, Vivian Ostrovsky a rÃ©alisÃ© plus de vingt films, la plupart tournÃ©s en Super 8, qui incluent souvent du found footage, des extraits de fictions, de documentaires, ou de home movies. Ses films exploitent le thÃ¨me du dÃ©placement et se situent, d`aprÃ¨s Yann Beauvais, entre le "film journal" et le "film collage". Elle travaille Ã©galement Ã la programmation du cinÃ©ma d`auteur et d`avant-garde du festival de film de JÃ©rusalem. Son travail a connu de nombreuses rÃ©trospectives et expositions dans les musÃ©es et les festivals Ã travers le monde ; Ã la fois pour ses films et ses " films- installations ". The actors Ledger, Walker & Hoffman try to establish contact with each other. In a volatile state between mind and consistent figure, they navigateâ€”at once helpless and aggressiveâ€”through the that can no longer be changed.the actors Ledger, Walker & Hoffman try to establish contact with each other. In a volatile state between mind and consistent figure, they navigate “at once helpless and aggressive” through the that can no longer be changed. Portraits of women. And men, who are spellbound by them. The painted portraits, a recurring motif of film noir as well as European postwar cinema, aesthetically stand in a tradition of an outmoded academic style that is bent on striking likeness with the model. They are revenants, omens of absence, metaphors for loss and death, objects of desire and fixation, which mesmerize both the viewer in the movie and in front of the screen. Working almost exclusively with animated art, mostly as single channel videos. Through animating my own drawings, I am mediating tales of human relationships and not shying away from life’s darker and more destructive sides. Since 1994 I’ve created over 30 videos, works that generally are narrative and deal with issues like domestic violence, power structures and human behaviours. My works have all been screened at numerous occations worldwide and I’m represented at several art institutions, among them Moderna Museet in Stockholm and Centre Georges Pompidou in Paris. Maya Schweizer (b.in Paris, France) lives and works in Berlin. She studied at the university, Aix-Marseille I, at the Academy of Visual Arts Leipzig and Berlin University of the Arts, where she graduated. Maya Schweizer exhibited at Kunstverein Leipzig (2017-2018), Drawing Room Hamburg (2017-2018), Irish Museum of Modern Art, Dublin (2016); Skulpturenmuseum Glaskasten Marl (2016); Nordstern Videokunstzentrum, Gelsenkirchen (2016); Staatliche Kunsthalle Baden-Baden (2015);GRASSI Museum für Angewandte Kunst Leipzig (2015); MWW Wroclaw Contemporary Museum (2015). She recently screened at Videoart at Midnight, Berlin (2018), Traverses Vidéo, Toulouse (2018), Vancouver International Film Festival, Canada (2017), Cinema in viennacontemporary, Vienna, Austria (2017), in Oberhausen 63. International Kurzfilmtage Oberhausen (2017) and at the 67. Berlinale, Forum Expanded, Berlin (2017). She received the Research stipends from the Berlin Senat (2017), Research grant from Goethe Institute Neapels and the Fundazione Morra-Museo Nitsch, Naples (2017), and the residency at the Watchtower, Flutgraben, Berlin (2016-2017). Impossible architecture, an ancient burial ground and a lure for psychotic janitors were the building blocks of Overlook Hotel in Stanley Kubrick’s The Shining. In this story vignette, chaos animators Pink Twins add zero gravity and a rupture in space-time continuum to the mix and serve a taster of subtle cosmic horror. Pink Twins is a duo of visual artists and electronic musicians, brothers Juha (b. 1978) and Vesa VehvilÃ¤inen (b. 1974), based in Helsinki, Finland. Active as Pink Twins since 1997, their videos work on the crossing of visual art and music. Live Pink Twins deliver improvised digital soundscapes, often combined with video screenings. Pink Twins have shown their works in exhibitions and festivals in all continents and performed audiovisual live shows through Europe, Americas, Asia and Australia. Vivian Ostrovsky interroge la représentation du vertige au cinéma, comme un catalyseur d’images étranges, inquiétantes, flottantes allant de l’effet psychologique au comique. Carsten Aschmann créé une rencontre post-mortem improbable entre les acteurs Ledger, Walker et Hoffman. Ils essayent d’entrer en contact les uns avec les autres mais, agressifs et démunis, ils naviguent dans ce qui ne peut plus être changé. Christoph Girardet agence des portraits de femme, comme motif récurrent dans le film noir et le cinéma d’après-guerre. Elles deviennent des revenantes, des présages de l’absence, des métaphores de la perte. Cecilia Lundqvist manifeste l’inquiétude de savoir que la vie éternelle n’est pas accessible à tous. Maya Schweizer nous conduit dans un paysage de ruines et de références, avec Edgar Allan Poe, Orson Welles et d’autres fantômes encore. Le duo Pink Twins revisite une architecture impossible, celle de l’Hôtel Overlook de Stanley Kubrick dans « Shining ». Le chaos s’anime, sous gravité zéro. La rupture dans le continuum spatio-temporel, sert ainsi une subtile horreur cosmique.